Biram Dah Abeid, the founder of the Initiative for the Resurgence of the Abolitionist Movement (IRA) and an antislavery campaigner in Mauritania - a country where "slaves are not restrained by chains", but are a part of rigid socio-economic structure and division of labor steeped in racism - was once told "the Haratin were a special group in a special situation". He did not agree. 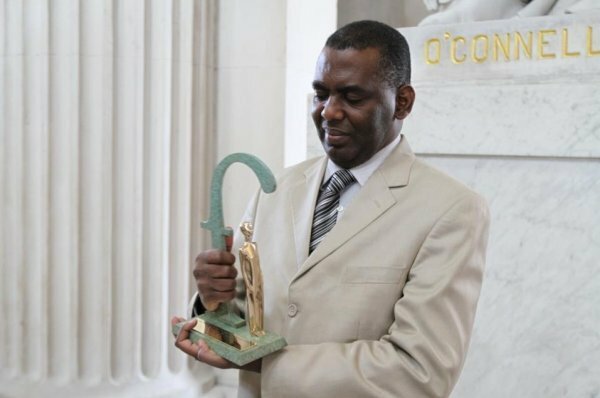 In Mauritania, with the highest rate of slavery in the world, Biram Abeid's activism revolves around raising awareness about the possibility of a slavery-free life. Mauritanian slaves are disempowered and segregated by illiteracy, poverty, geography, history, ongoing discrimination and influenced by a pro-slavery interpretation of Islam. With approximately 140,000 enslaved Mauritanians, Biram Abeid's job is not an easy one. Through demonstrations, sit-ins, hunger strikes, marches, and general dissemination of information at home and abroad, IRA attempts to free slaves and pressure the Mauritanian Government to hold slave owners accountable for their crime. As Mauritanians continue to "exist somewhere on a continuum between slavery and freedom", Biram Abeid decided to run for the Mauritanian Presidenial elections in June 2014. Critics accused him of inciting racial tensions, but for him, it was an opportunity to start a nation-wide debate about slavery and racism. UNPO continues to support the noble and ambitious work of Mr Biram Dah Abeid in determination to act against slavery, in all its forms and across the world. Members of UNPO, and in particular the Haratin, are witnesses, if not victims, of all forms of contemporary slavery and of the international leaders’ - both political and economic - continued lack of efforts towards its eradication. UNPO's International Campaign Against Slavery calls on the United Nations General Assembly to take a strong step towards the eradication of slavery by adopting a resolution and ensuring its implementation. Alongside this, the campaign aims to increase awareness about the topic of contemporary slavery: its roots, its causes, its forms, its victims, its consequences, those who fight against it and the way forward to abolish it. To free slaves and to force the government to imprison slave owners, IRA holds sit-ins in front of the justice ministry, stages hunger strikes, and marches through cities and towns around the country. “We are always protesting something,” Brahim Abeid, a gregarious IRA vice-president, said. Sometimes, police beat protesters, or spray them with tear gas. After demonstrations, IRAsends press releases to supportive human-rights organizations in Europe and the United States, and circulates them within the Mauritanian diaspora. The government tends to respond to protests in one of two ways: it imprisons activists, or it puts slave owners in jail, only to release them within days and close the cases. Several of the men who spoke at the public prayer were later arrested. When boys come of age, they sometimes manage to leave their masters’ families. Adult women are considered minors by Mauritanian custom, and female slaves face greater difficulty escaping. Abeid argues that there is a kind of informal coalition—Beydanes, the state, police, judges, and imams—that prevents slaves from leaving their masters. “Whenever a slave breaks free andIRA is not aware and not present, police officers and judges help Arab-Berbers to intimidate the slave until he returns in submission,” Abeid said. Slave owners use physical abuse and threats of death. Children are beaten and women are raped. Courts have ruled that slave owners have the right to former slaves’ inheritances, even to their children.